by Sandra F. Rief M.A. Sandra Rief offers myriad real-life case studies, interviews, and student intervention plans for children with ADD/ADHD. In addition, the book contains best teaching practices and countless strategies for enhancing classroom performance for all types of students. This is an excellent book for teachers. I saw it about six years ago, the first time in a grade school classroom in Paterson, NJ. It is a book that can help teachers to help children who demonstrate ADHD symtoms be successful in school. So, it is a recommended book. One thing that I would say is missing in this book is, it does currently subscribe to the medical model, that is, itis a pro-medication book. It really doesn't delve into the controversy of medication at all, but accepts the standard model for treatment. In that respect, I feel, the book falls short. For the reader interested in another view of this from psychologists and educators, please note the following books. These should supplement Sandra Rief's good work. These three, Susan Ashley's book is more for parents, Rethinking ADHD helps to lay an excellent theory for understanding childhood mental health issues, specifically ADHD, and Overcoming ADHD Without Medication is helpful for parents and for teachers. These, along with Sandra Rief's guidelines in teaching children with ADHD can be of much value for teachers and for parents who want to be more educated on this subject. This year 25% of my students are ADHD-Inattentive or ADHD- Hyperactive/Impulsive Type. It seems to me that the number of students I have with this disease is increasing every year. Being an early childhood elementary teacher, so many parents are refusing to medicate their children and would rather have them earn C's, D's, and F's than treat them. Then the parents wonder why they struggle with 2nd and 3rd grade in reading and content area. Most of them are in Tier II RTI. I purchased this book in order to help me in the classroom and document thoroughly their symptoms, behavior, and compliance. This is a great book! It has given me some good ideas to help my students learn to monitor their behavior. The bottom line is students' learning. 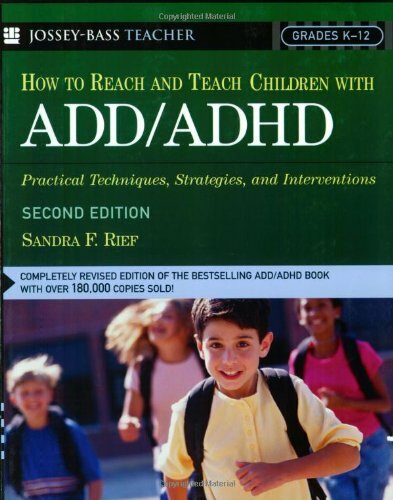 How to Reach and Teach Children with ADD/ADHD is a truly fantastic resource for educators trying to best serve children with ADHD.Rief begins the book by demystifying ADHD, writing a succinct summary of ADHD and how it manifests in academic domains.She moves on to sharing suggestions on how to best manage ADHD in different tasks like math, reading, and writing. Her suggestions are research-based and easy to implement.I found her writing easy to read, and I really liked how she interspersed bullet points into the text to clearly and quickly move through a lot of material.I shared this resource with some classmates in my special education master's program, and three ended up ordering their own copies.Teachers, if you purchase any book about ADHD, make sure it is this one. This is an excellent book.It provides a clear explaination of ADD/ADHD. 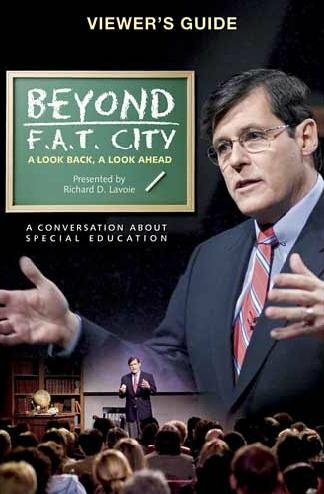 As well as pratical learning and studying techniques for students with ADD/ADHD to succeed.I highly recommend this book. 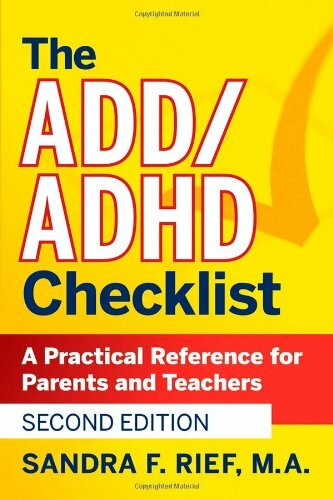 The ADD/ADHD Checklist helps parents and teachers to better understand children and teenagers with attention problems and provide the kind of support and intervention that is crucial to kids' success. Presented in a concise, easy-to-read checklist format, the book is packed with practical advice and information on a wide range of topics, including what we do and don't know about ADHD, probable causes, critical elements for school success, the most commonly prescribed medications, what children with ADHD need at home, effective behavioral strategies, how to help kids stay organized, and advocating for an ADHD child. I have a 5 year old son who was just diagnosed with ADHD. We bought several books on the subject but I thought this was the best. It is straightforward, easy to read, well organized and full of manyuseful facts. It has really helped us understand the disease better. We have been able to make some positive changes both at school and home. I would definitely recommend this book. The checklist format of the book (really more like bullet points) makes it easy to locate and absorb the information you are looking for.Once you've read the book, the format is great for future look-ups. You get a little freaked out reading this book... because *every* kid is like this.They are, by nature, childish.Impulsive, inappropriate, wiggly... poor concentration, inconsistent, daydreaming.And we grown-ups get this under control, but in times of stress, you see all the same childish behaviors coming out of adults, too.So when a parent is frustrated by their children's "childishness," it is appropriate to remember that they are only children. This book assumes that you have (or are working toward) a diagnosis of ADD/ADHD and lists all kinds of information, categorically.Information for parents, for teachers, and for ideas to try.It's good information for any parent because... well, children are childish. I'm not a teacher (apart from Sunday school), but there was good information in there for parents.I thought the most helpful sections were on positive incentives and reinforcers for home (Section 2, list 25), Giving Directions -- Tips for Parents (Section 2, list 28), and Getting Student's Attention (Section 3, list 40).Any parent can benefit from adding more structure to the home, creating a sense of excitement, and being positive and encouraging. The book was written in 1998.I would be interested in learning what developments have taken place in the past decade, for example, with rates of diagnosis and academic outcomes for children diagnosed in the 80s and 90s. I have a kid who is possibly ADD or possibly just a kid.This book is OK and readable enough but the Barnum effect insures that you see any kid within it's pages.Take it with a grain of salt.